• WR Manny Cordova, 6-2, 170, Sr.
Reload or rebuild? : That is a big question to ask when looking at the history of the Naples program under Coach Kramer. However, from the sounds of it, it will just be more of a reload for the Golden Eagles despite having to replace 25 seniors who all have graduated. The reload will start with the five returning starters who will be called upon to provide a leadership role. According to the Naples Daily News, the Golden Eagles are having to replace nearly the entire defense as well as the entire offensive line and backfield starters. With a lot of the holes needing to be filled coming in the skill position department, new faces including Jordan Persad-Tirone at quarterback and Sam Faustin at corner are going to have to develop fast to make sure the Golden Eagles stay in games. Another nine-game schedule: The schedule for the Golden Eagles consists of only nine games once again after attempts to lock in a 10th game have turned up empty handed. With the success Naples has had over the last few years with some deep playoff runs, it could be partly to blame as to why some teams are just flat out in refusing to put the Golden Eagles on their schedule. However, that has not stopped them from being successful and that extra bye week could be extra useful if anything unforeseen happens. Who’s your rival? 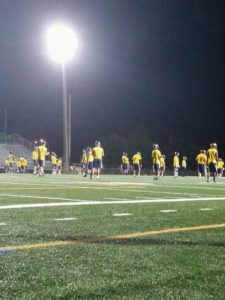 : Naples might not have a clear defined rival despite the fact that they play Lely every year for the Coconut Bowl, something the Golden Eagles have come to dominate in recent years. Coach Kramer tells us that everyone that they play on the schedule from Southwest Florida is pretty much a rival at this point. Considering out of all teams in Lee & Collier counties, only two teams have managed to come back home as state champions with Naples being one of them (the other being Immokalee), so it is certainly a good reason why these teams circle the games on the calendar against the Golden Eagles. • Aug. 26 vs. American Heritage (Delray) – Given this was the only loss during the regular season last year for the Golden Eagles, this is certainly that key non-district game to watch. Both teams will certainly not looked like what they were last year when they hit the field, but it could certainly be a game that goes down to the wire which could allow Naples to get the season started off on the right note. • Oct. 14 vs. Palmetto Ridge – With Palmetto Ridge returning 9 seniors on defense, this could be a game that Naples will have to make sure they don’t get too overconfident in – even if it is at home. A win here will likely secure them the district championship. A loss, however, could put the district in complete chaos with Barron Collier looking to also steal some of the spotlight this season. 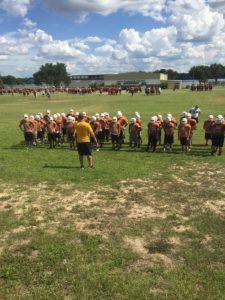 “[The] Golden Eagles will have to work hard in-season and out-of-season to continue the Naples Football tradition and uphold the legacy that is Naples High Football.” – Coach Kramer on the outlook of his team for 2016. With only five starters back on both side of the ball, Naples certainly will have to make sure they are ready to come August 19 when they host St. Petersburg Lakewood in the kickoff classic. It will be the first glimpse of everything the Golden Eagles did during the summer and during the first weeks of practice. But it might not be necessary at the same time. During their spring classic against North Miami, the Golden Eagles were able to score nine points on the field before the offense even got a play in, according to the Naples Daily News. In that report, some of the players felt like they had a chip on their shoulder, especially after the way last season came to an end with a loss to Miami Central in the Class 6A state semifinals. The game saw the Golden Eagles walk all over North Miami with different ways of scoring, winning 50-13 in front of the home crowd. Coach Kramer did tell us that Jordan Persad-Tirone threw 2 TDs in the spring game in his debut as the leader of the offense. The Golden Eagles, as we have established, are going to be relying on a lot of new players that are either rising up from the junior varsity or freshman teams to fill in some big voids left open by players like QB Kieran DiGiorno, RB Carlin Fils-Aime and DB Tyler Byrd. That is going to put the pressure on Persad-Tirone, Marcelino Charles and Sam Faustin to come around quickly to keep the look of the 2015 team. Overall, look for the Golden Eagles to keep winning games, but don’t expect it to fully come at the pace they have come at over the last few years as the rising players take their place to continue building upon the excellence that Naples has built.